View the Labels/SDS information for Secure Action Fungicide. 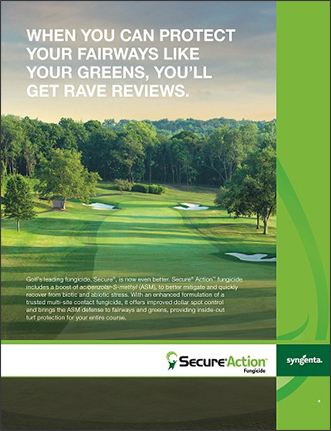 Golf’s leading fungicide, Secure®, is now even better. Secure® Action™ fungicide includes a boost of acibenzolar-S-methyl (ASM), to better prevent and quickly recover from biotic and abiotic stress. With an enhanced formulation of a trusted multi-site contact fungicide, it offers improved dollar spot control and brings the ASM defense to fairways and greens, providing inside out turf protection for your entire course. For suppression of bacterial wilt on bentgrass and Poa Annua greens, apply Secure Action in a seasonal program with Daconil Action or Heritage® Action™. If dollar spot pressure is high, Posterity fungicide is an excellent rotation partner or tank mix for added protection. Secure Action is also excellent for curative dollar spot control. Please review the product label for specific application recommendations. For guidance on integrating Secure Action into your existing dollar spot control strategy, see Syngenta Agronomic programs. With up to 12 applications per year, Secure Action activates a plant’s natural defense against disease before a pathogen is present by triggering the salicylic acid pathway and protein production in advance of infection. Research shows that ASM works best when used as part of a season-long program. Rotating Secure Action with Daconil Action or Heritage Action fungicides provides drought mitigation, improved disease control and the ability to recover from abiotic stress for the entire course all season-long. Dr. Jim Kerns, associate professor and extension specialist at N.C. State University, walks through his summer bentgrass decline trial that included Secure® Action™ and Daconil® Action fungicides. Curative application made June 29, 2018. Photos taken July 13, 2018. 14 days after treatment. Source: Mike Mulhare, White Manor Country Club practice area, Malvern, Pennsylvania. Treated plot is a practice area that has divots, yet still it shows recovery from disease with Secure Action. All rates per 1000 sq. ft. Applications made on a 14-day interval beginning September 1, 2016. Trials conducted on MiniVerde® Bermudagrass. Source: Maria Tomaso-Peterson, Mississippi State University. Secure Action + Heritage Action	0.5 fl. oz./1000 sq. ft. + 0.4 oz./1000 sq. ft.
Insignia 0.4 fl. oz./1000 sq. ft. Secure Action 0.5 fl. oz./1000 sq. ft.
Heritage Action	0.2 oz / 1000 sq. ft. The enhanced formulation of Secure Action provides improved product stability during tank-mixing and storage. Image: Comparison of 3 products after standard 2 weeks of storage at 54° C. Source: Syngenta accelerated aging study. Conducted May 19, 2017 – July 27, 2017. Stein, Switzerland. Learn how Secure Action can control dollar spot on golf course turf. Performance assessments are based upon results or analysis of public information, field observations and/or internal Syngenta evaluations. Trials reflect treatment rates commonly recommended in the marketplace. Daconil® Action™, Daconil®, GreenCast®, Heritage®, Posterity® and the Syngenta logo are trademarks of a Syngenta Group Company. Secure® is a registered trademark of Ishihara Sangyo Kaisha, LTD. All other trademarks are property of their respective owners.